The Insolvency and Bankruptcy Code, 2016, was touted as the magic wand to resolve the problem of stressed loans—currently at over Rs10 trillion—in the Indian economy. The Reserve Bank of India’s June 2017 directive to bankers to file petitions against 12 large defaulters kick-started the process of resolution under the new framework. The 270-day deadline to approve a resolution plan, failing which a company must undergo liquidation, is approaching in many cases. It has passed in the case of three companies. 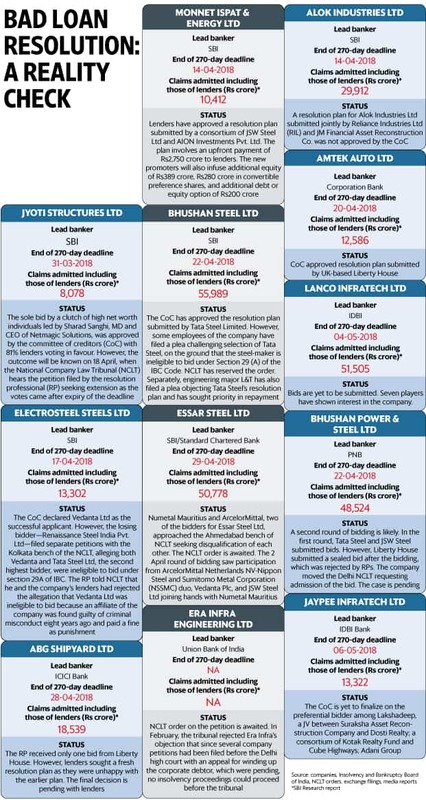 While there has been interest for steel companies, most of them are also caught up in litigation. The large defaulters undergoing bankruptcy proceedings include Jyoti Structures Ltd, Monnet Ispat & Energy Ltd, Alok Industries Ltd, Amtek Auto Ltd, Bhushan Steel Ltd, Lanco Infratech Ltd, Electrosteel Steels Ltd, Essar Steel Ltd, Bhushan Power & Steel Ltd, ABG Shipyard Ltd, Era Infra Engineering Ltd, Jaypee Infratech Ltd.